Cetyl myristoleate is a unique esterified fatty acid with a distinct structure that supports joint health and function. Most animal species are unable to manufacture cetyl myristoleate on their own and must, instead, acquire it from outside sources. And that’s what makes the Advanced Cetyl M and CM Responce formulas a superior choice for joint health and funtion. Each formula is scientifically balanced with cetyl myristoleate and other proven ingredients to support healthy joints and mobility—and may also help ease aching and discomfort caused by rigorous activity, training and competition. 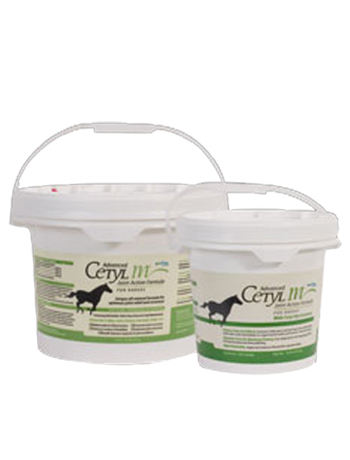 Initial Period: Average size horse (900-1200LB): Administer 1-2 Scoops (38.5-77 grams) twice per day. Large Horse: Administer 1 – ½ scoops (58 grams) once per day. Maintain at higher rate when needed. Maintenance: Average size horse (900-1200LB): Administer 1 Scoops (38.5 grams) once per day. Large Horse: Administer 2-3 scoops (77-115.5grams) twice per day.